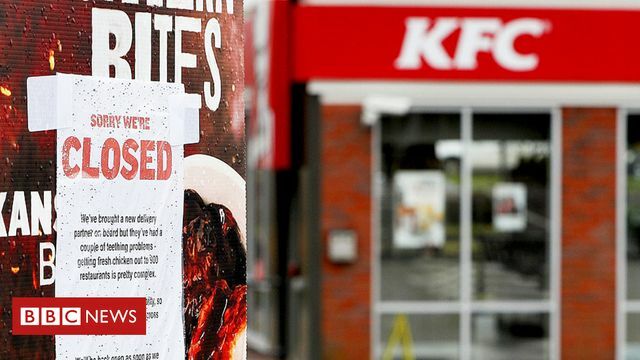 Although over 95% of KFC restaurants in the UK are individually run franchises it would appear some services are still carried out centrally; notably, the procurement process which selects suppliers. Apparently, however, risk management may not be one of those shared services, as a switch of supplier from Bidvest to DHL this week has seen the closure of 646 of the company's 900 UK based outlets due to a lack of chicken being delivered. The incident may well pass in a few days, but the financial cost to many of these small franchises could be considerable. For now, however, the most important question is... where do I get my lunch? Last week, the fried chicken chain switched its delivery contract to DHL, which has blamed "operational issues" for the supply disruption.